Boo! 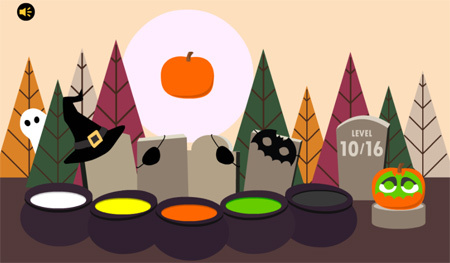 Factory Balls Halloween is the latest puzzle game by Bart Bonte, who had published several very good puzzle games such as Yellow, Factory Balls, What’s inside the Box, and Sugar Sugar. Your goal in each level is to make a pumpkin just like the one in the bottom right corner. You do this by dipping your pumpkin in the paints and by wearing attributes to mask certain parts of the pumpkin. The game features 16 puzzles based on Factory Balls app, these levels are challenging but not too hard. If you get stuck in the game then check out the video walkthrough for the game. This entry was posted in Android Games, iOS Games, Mobile Games, Walkthrough and tagged Boo! Factory Balls Halloween Answers, Boo! Factory Balls Halloween Cheats, Boo! Factory Balls Halloween Gameplay, Boo! Factory Balls Halloween Hints, Boo! Factory Balls Halloween Solutions, Boo! Factory Balls Halloween Tips, Boo! Factory Balls Halloween Walkthrough by Marvin. Bookmark the permalink.